A beautifully crafted romance directed by Colette Robert is unfolding at Chester Theatre this summer: Mary’s Wedding by Stephen Massicotte. Taking place in Mary’s dreams, memories and imagination, this show is a tour-de-force for its two fine actors. It tells the tale of young lovers Charlie and Mary, who meet in rural Canada just before the outbreak of the World War I. As Mary, Marielle Young is winning and courageous: a perfect heroine. She strikes just the right blend of ingénue and independence in her character, and is a pleasure to watch onstage. Ms. Young also plays another role in the production: that of officer Gordon Muriel Flowerdew, a historically based character, whose bravery during the last cavalry charge in military history earned him great honor. Her portrayal of this war hero is just as strong and memorable as her Mary; she clearly expresses both Flowerdew’s strength, and the softer side of this soldier’s heart, in the special friendship he develops on the battlefield with Charlie. Steven Lee Johnson is forthright, charming, and completely believable as Charlie, transitioning from ingenuous youth to young man in love, and then into the ardent and patriotic soldier. He never loses Charlie’s simple faith and integrity, thus endearing his character to both Mary and his commanding officer (not to mention his audience.) Mr. Johnson’s subtle comic timing makes for some of the most delightful light-hearted moments in the play. As always at Chester Theatre, the artistry of the production elements harmonize and enhance the stories portrayed on the stage. 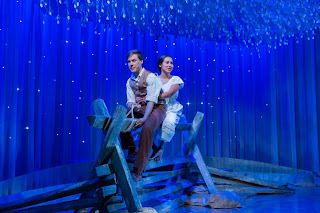 Lighting Designer Lara Dubin has surpassed even herself in this production with dazzling thunderstorms, starry heavens, dark austere looks on the battlefield reminiscent of old black and white photos, and delicate color transitions on the sky field of flowers hanging above the actors. 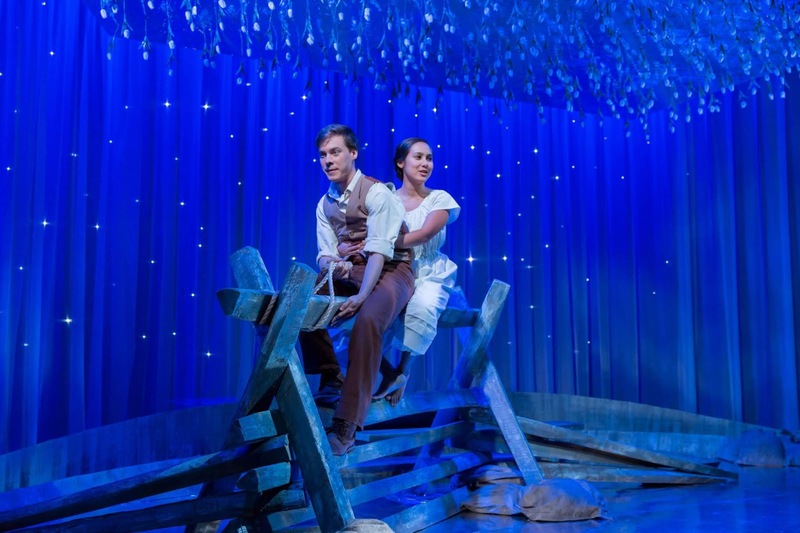 Simple stage elements cleverly designed by Travis George morph into completely different worlds: a horse in the Canadian countryside, a war-torn trench in France, a farm fence, a home; and the field of flowers growing invertedly from above is breathtaking. Sound Design by David Wiggall includes a beautifully orchestrated thunderstorm, highly realistic battle explosions and a lovely old Strauss waltz… and costumes by Elizabeth Pangburn reflect the characters and fit the period (Mary’s wedding dress is simply perfect.) This artistic team deserves an ovation. The creativity of director Colette Robert is in everything throughout Mary’s Wedding, making the transitions between all the different times and locales easy for the audience to follow: no small feat. The dreamlike quality of each scene, natural pace of the dialogue and the lovely chemistry between all the characters show a master’s hand. Bravo!